... and so do the volcanoes! The blowing of a blizzard, the flapping wings of a flight of starlings, the bells of the cows in the pasture, the silence. Our seven rooms are still as they always were in old times, very close to Mont-Dore: a place of relaxation and tranquility where altitude, clean air and nature guarantee quality sleep. For a night away, for a weekend or for your holidays in Auvergne, put down your suitcases and let yourself be overcome by a feeling of well-being. 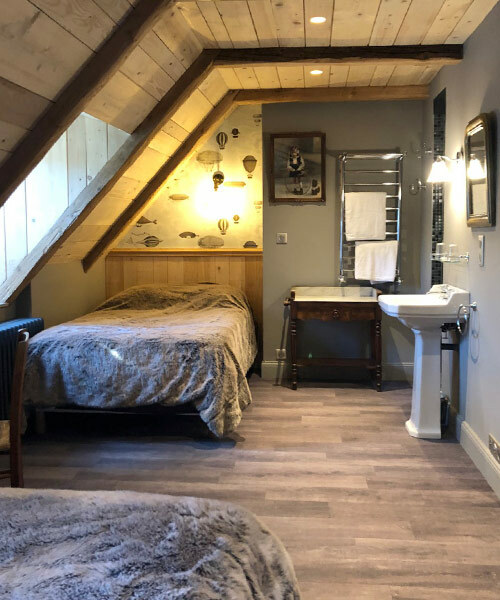 From the double room to the suite through the family room, we welcome you according to your needs: 5 minutes from Mont-Dore or Orcival, 15 minutes from La Bourboule and 20 minutes from the Chaîne des Puys, Le Puy de Dome or Charade circuit, the Auberge du Lac de Guéry is ideally located to visit the Auvergne. All rooms are open to the surrounding nature with an unobstructed view of Lake Guéry, neighboring volcanoes or the Massif du Sancy. Each room has a bathroom, private WC and free wifi. No television, cinema is at your windows. Breakfast is served in the restaurant or bar, facing the Lake Guéry, from 8 am to 10 am. The reception is open from 8 am to 11 am and from 4 pm to 8 pm. Please let us know for an arrival or departure outside these time slots.